CerTest Streptococcus pneumoniae card test is the new chromatographic immunoassay for the qualitative detection of Streptococcus pneumoniae in human urine samples. Streptococcus pneumoniae infection leads to many clinical manifestations including meningitis, septicaemia, bacteraemia, pneumonia, acute otitis media and sinusitis. It has caused great morbility and motality worldwide, especially in children. Pneumococcal infection annually has caused approximately 14.5 million cases of invasive penumococcal disease (IPD) and 0.7-1 million deaths in children under five years old, mostly in developing and underdeveloped countries. 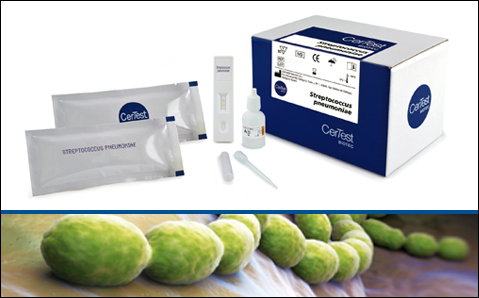 The CerTest Streptococcus pneumoniae allows for early diagnosis of Streptococcus pneumoniae infection through detection of a specific soluble antigen present in the urine of patients with infection. The test is rapid, giving a result in 15 miuntes, and utilizes an urine specimen which is convenient for collection, transport and subsequent detection of early, as well as later, stages of disease.